Beautifully renovated house in the Albaicin with views of the Alhambra. This lovely and quiet house is suited for a family. 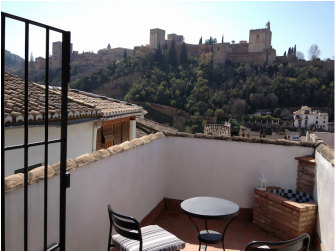 It has gorgeous views of the Alhambra, a modern kitchen with washing machine, heating in every room and there is also a biomass stove for the entire ground floor. Lots of natural light from the south, facing the hill of the Alhambra. Only 5 minutes walk from Plaza Nueva, where the old city meets the new and with all tourist attractions being at walking distance: Alhambra, Cathedral, San Nicolas, Royal Chapel, Arabic Baths, Sacromonte.